(Evan Vucci | AP Photo) President Donald Trump listens to a question during a cabinet meeting at the White House, Tuesday, Feb. 12, 2019, in Washington. 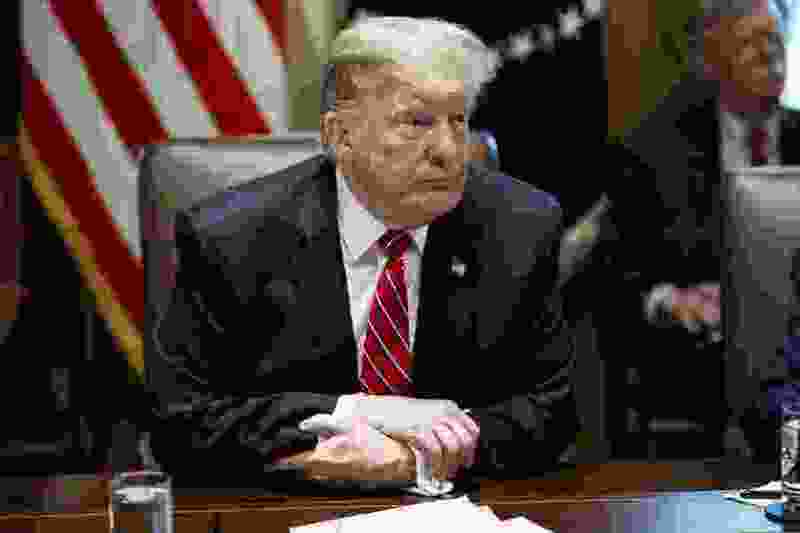 Washington • President Donald Trump said Tuesday he’s “unhappy” with a hard-won agreement to prevent a new government shutdown and finance construction of more barriers along the U.S.-Mexico border, but he didn’t say he wouldn’t sign the measure. GOP congressional leaders swung behind the proposed deal, selling it as a necessary compromise. Trump said he doesn't believe there will be a shutdown, which could have hit hundreds of thousands of federal workers again this weekend. "Everything" is on the table, he said at the White House, but "we certainly don't want to see a shutdown." "I can't say I'm happy. I can't say I'm thrilled," he said. But one way or another, he said, "the wall's getting built." At the White House on Tuesday, spokesman Hogan Gidley was noncommittal: "We want to focus on what's actually in the document. Until we see that, it's going to be very difficult to have a conversation about what we will and won't accept. The agreement means 55 miles of new fencing — constructed through existing designs such as metal slats instead of a concrete wall — but far less than the 215 miles the White House demanded in December. The fencing would be built in the Rio Grande Valley in Texas. It closely mirrors Trump’s original budget request from last winter. But Fox News Channel's Sean Hannity, a Trump ally, said the barrier money in the agreement was inadequate. He warned late Monday that "any Republican that supports this garbage compromise, you will have to explain." Conservatives like Rep. Mark Meadows, R-N.C., who has the ear of Trump, also came out in opposition. "I would hope that Sean Hannity and all the other people you mentioned aren't running this government. This was a bipartisan deal, Senate and House, Republican and Democrat," Democrat Lowey said on CNN. "We'll take as much money as you can give us, and then we will go off and find the money someplace else - legally - in order to secure that southern barrier," acting White House Chief of Staff Mick Mulvaney told Fox News Friday. He said more than $5.7 billon had been identified that Trump could tap. The agreement yielded curbed funding, overall, for ICE detention beds, which Democrats promised would mean the agency would hold fewer detainees than the roughly 49,000 detainees held on Feb. 10, the most recent date for which figures were available. Democrats said the number of beds would be ratcheted down to 40,520 by year's end. "The president still has a few more tools in his toolbox," GOP Leader McCarthy said.